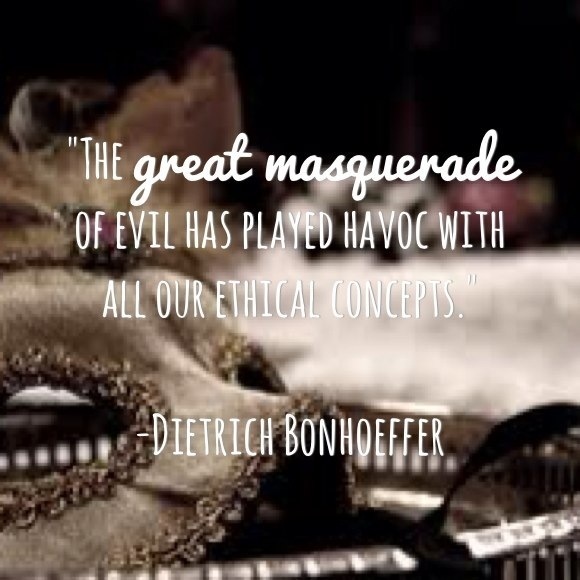 “The great masquerade of evil has played havoc with all our ethical concepts. For evil to appear disguised as light, charity, historical necessity, or social justice is quite bewildering to anyone brought up on our traditional ethical concepts, while for Christians who base their lives on the bible it merely conforms the fundamental wickedness of evil. As I was reading some of the amazing work of Dietrich Bonhoeffer this morning, this section really struck me. We are in the midst of a culture and generation that is full of this evil in disguise that Bonhoeffer wrote about. But who will we choose to be? Dietrich Bonhoeffer doesn’t just say that we should choose to be obedient and responsible to God when it’s convenient or when we feel like it. He states that our whole lives should be an answer to what God has called us to do. This statement is inspiring and challenging. Perhaps you’re in a place where you don’t know what God has called you to do or what you can contribute to the world today. Be prayerful about it, and equip yourself, because this is a huge, life long responsibility, so when God calls you, are you ready to answer? Previous postMeet some of the cast & crew, and contribute to the COAPS wrap party!